Home Unlabelled SLEEPING ON YOUR STOMACH – GOOD OR BAD? SLEEPING ON YOUR STOMACH – GOOD OR BAD? Sleep is one of the most satisfying simple pleasures life has to offer. It rests our mind and body and gives us energy for the next day. Only effective sleep gives us a true pleasure. Some sleeping positions can cause serious neck and back pain. Some positions are even bad for the skin, the breasts and the blood flow. According to a research conducted by Mayo Clinic, many people that are sleeping on their stomach wake up with pain in the neck, back and joints, but they also feel tired. It has been proven that sleeping on your stomach puts pressure on the spine and since the spine is a pipeline for your nerves, spinal stress can cause pain anywhere in your body. This sleeping position is not recommended for pregnant women either. Sleeping on the left side increases blood flow and oxygen intake but also more space for the baby to move instead being pressed against the mattress. Side-sleeping is better for the overall health, provides more neutral spine position and reduces snoring. Back position is considered to be the best one. Sleeping on your back makes it easy for your body to maintain a neutral position and prevents numbness of parts of your body. 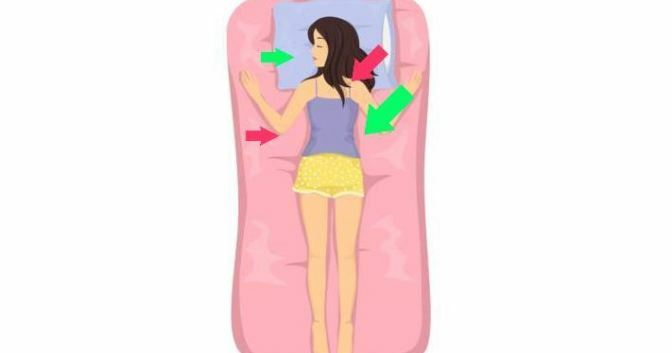 This sleeping position is good for your skin, as well. It reduces the level of getting wrinkles during sleeping due to the bad sleeping position but it also helps in maintaining the shape of the breasts. 1. Use thinner and comfortable pillow that will give adequate support to the head and neck and allow neutral position of the spine. 2. Put a pillow under your pelvis. This will help keep your back and spine to be in a more neutral position and take pressure off your spine. 3. Stretch in the mornings. Slight warm-up, stretching and a few gentle exercises will return the body to normal and improve the blood flow.